Yeah you know, lately I have no muse for writing. So what can you do in that case? 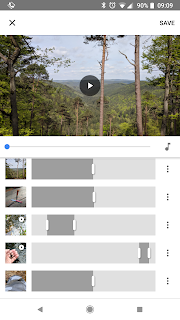 Yes, let Google Photos make a short video of your recent adventures. Well, unless, it doesn't work as intended. I can edit the video clip fine. It shows everything correct in the app and on the Google Photos site in the web. But when I exporting the video, or upload it to YouTube, all my edits are gone. Strange thing, even the YouTube Version and (where the edits are completely gone) the downloaded versions (some edits are in place but some parts slowed down and too short) are differing. ?.? ummm... It's completely repeatable and happens all the time. Very strange behavior. So no Google Photos video creation for me. Now using PowerDirector Pro. But it's much wore work and sans the nice free music theme. Ugh... I really think that the software gets completely out of hand lately. Why this is a big deal? Well, I edit out some parts which private information. And the YouTube Version exposed those 😱. Luckily I uploaded it non-public.